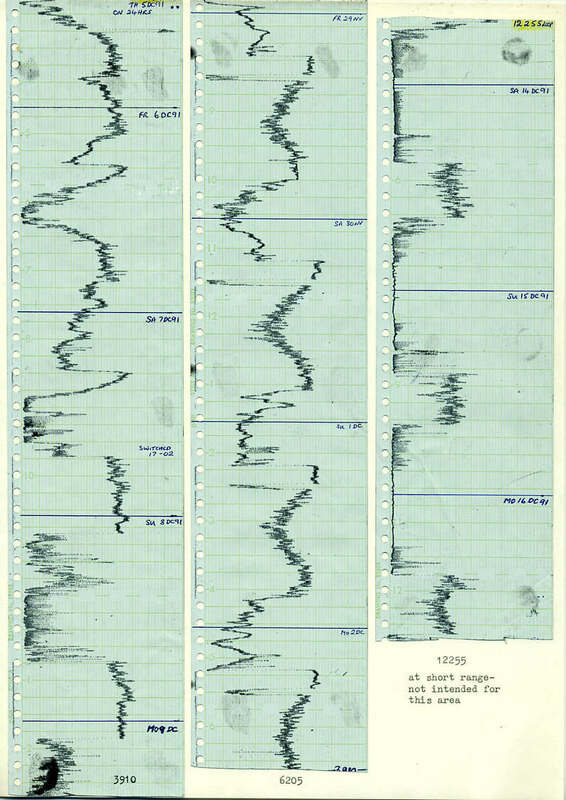 Before computers, time records of radio station signal strength were made on paper chart recorders, either using ink or specially coated pressure sensitive paper, as here. These are some sample continuous chart recordings of Radiofax short wave services on 3,910, 6,205 and 12,255kHz. At the start of its chart, the 3,910 service was on test 24 hours a day, before becoming night only; 5pm till 2am. On 6,205, HCJB, Equador, can be seen for two hours each morning, followed by Radiofax fading in shortly afterwards. Short skip conditions, with abrupt fade-in and fade-out, sometimes made 12,255 audible at this range. On one occasion, 12,255 was received as a lower sideband-with-carrier signal for a full minute, until the MUF moved further upwards. The dB field strength calibrations are not shown here.